If chicken soup is famous for making you feel better, then this soup should keep you feeling great! 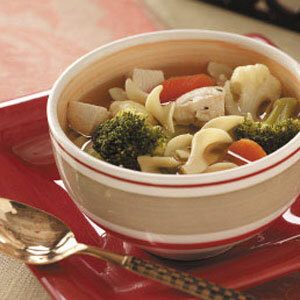 Loaded with vegetables, this noodle soup is a wonderful start to any meal. Combine celery, leek, carrot, turnip and 1/3 cup chicken broth in large saucepan. Cover; cook over medium heat 12 to 15 minutes or until vegetables are tender, stirring occasionally. Stir in remaining 5-2/3 cups broth, parsley, thyme, rosemary, vinegar and pepper. Bring to a boil; add noodles. Cook until noodles are tender; stir in chicken.